As the deadly outbreak of Ebola in West Africa continues to claim lives, Prof Peter Piot, Director of the London School of Hygiene & Tropical Medicine, Prof David Heymann, Head of Chatham House Centre on Global Health Security and Professor of Infectious Disease Epidemiology at the School, and Dr Jeremy Farrar, Director of the Wellcome Trust, call for patients in Africa to be given access to experimental Ebola medication. This joint statement was originally published in the Wall Street Journal. A virologist carrying out mouse experiments in a lab in Hamburg five years ago accidentally pricked her finger. 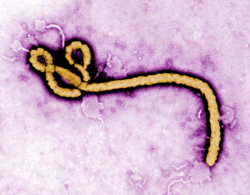 The syringe contained the Zaire Ebola virus, the same strain wreaking havoc today in Guinea, Liberia and Sierra Leone. There is no approved treatment or vaccine for Ebola, or even one that has passed the first phase of safety trials in human volunteers. Yet unlike those exposed to Ebola in West Africa recently, the Hamburg virologist was quickly offered an experimental vaccine. This vaccine hadn’t yet been tested on humans, but it had been shown to offer primates some protection against Ebola infections. For the virologist, it wasn’t a good option, but it was the only one available in the face of a virus with an extremely high mortality rate. She chose to take the vaccine. We expect it is a risk we would take if one of us were exposed to Ebola. The Hamburg researcher didn’t fall ill. It is unclear exactly how the vaccine worked, or indeed whether she was ever infected. What is important is that immediate access to an experimental vaccine allowed her to try something with the potential to protect her. It is highly likely that if Ebola were now spreading in Western countries, public-health authorities would give at-risk patients access to experimental drugs or vaccines. Indeed, there are reports that two U.S. relief workers infected with Ebola in Liberia have been offered experimental therapies, which they have accepted. There are antiviral drugs, monoclonal antibodies and vaccines under study that have shown varying degrees of effectiveness in animals that have been infected with or exposed to the Ebola virus. Medical agencies in rich counties affected by Ebola would begin discussions with companies and labs developing these products and then make rapid decisions about which of them might be appropriate for compassionate use. The African countries where the current outbreaks of Ebola are occurring should have the same opportunity. African governments should be allowed to make informed decisions about whether or not to use these products, for example to protect and treat health-care workers who run especially high risks of infection. The World Health Organization could assist African countries with developing rigorous protocols for the use and study of experimental approaches to treatment and prevention, while coordinating more traditional containment measures. As the only body with the necessary international authority, it must take on this greater leadership role. Affected communities would need to be made fully aware regarding treatment options through open and responsible communication. And the international community must work hard to break down the barriers of fear and mistrust. In a region racked by civil war and poverty, international agencies need to be aware of infrastructure limitations, as well as those imposed by cultural and religious sensitivities. Experimental treatments shouldn’t be rolled out generally without prior safety testing. But in the face of the critical challenge in West Africa, the WHO and Western medical agencies should be helping countries weigh the risks and benefits of a limited deployment of the best candidates to those in the greatest need, while continuously monitoring safety and efficacy. This epidemic is now so extensive that we can expect it to last for some months yet. That means the West must fast-track safety testing of drugs and vaccines in unaffected countries, so that those which perform well could go into fuller trials in the affected region before the outbreak ends. Even if results come too late to allow trials this time around, this approach would allow studies to begin quickly when Ebola next strikes. Ultimately, the only way of discovering whether these new interventions are effective will be to test them in an Ebola epidemic. Experimental treatments aren’t a substitute for standard infection-control measures. Past Ebola outbreaks have demonstrated which containment approaches are effective: hospital-infection control, self-protection of health workers, community education about how to avoid infection, and placing those exposed under fever surveillance and isolation for a full 21 days. These measures, however, have failed to stop the West African outbreak, because of profound distrust in authorities and health services, strong traditional beliefs concerning disease causation and funeral practices, and, until recently, a lack of leadership. Populations have grown, people travel more and there are more people living in major cities—all of which complicate the containment of Ebola and other highly infective diseases and multiply the risks of catastrophic outcomes. These dire circumstances call for a more robust international response. This comment piece was originally posted in the Wall Street Journal on 5 August 2014.